PBS Annual Meeting, San Francisco, CA, May 14, 2014 – Today at its annual meeting with PBS member stations from across the country, PBS KIDS announced the premiere date for its newest series ODD SQUAD. The live-action media property follows two young government agents, Olive and Otto, who use math skills and collaboration to investigate weird and unusual phenomena. 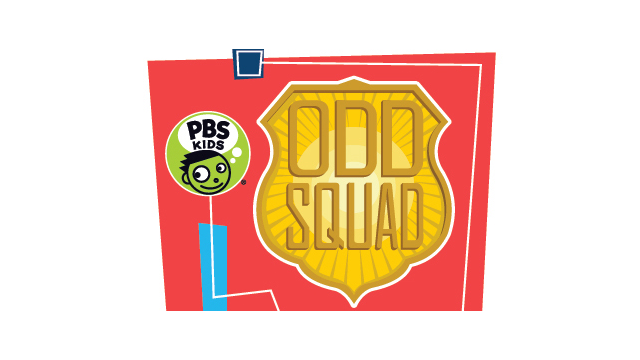 ODD SQUAD will premiere Wednesday, November 26, 2014, on PBS KIDS with a special one-hour broadcast of two back-to-back episodes, along with integrated digital and offline content. The series will air on weekdays following the premiere (check local listings). In each episode of ODD SQUAD, the young agents use math to put things right when oddness strikes. Olive and Otto solve cases ranging from disappearing zeroes to runaway dinosaurs, and the agents often find additional clues in the “Mathroom,” a futuristic space that is just a teleport away. The ODD SQUAD television series is part of a multiplatform media experience that will include interactive content online and on mobile. With ODD SQUAD’s digital content, kids will have the opportunity to solve cases and stop oddness, just like Olive and Otto and the rest of the Odd Squad. The show’s interactive features will include games, parent resources, mobile apps and more. Images, episode descriptions and additional press materials for ODD SQUAD are available on PBS PressRoom. Sinking Ship Entertainment is an award-winning production and interactive company that creates and produces groundbreaking kids TV and transmedia content. Since its founding in 2004, Sinking Ship has created and produced numerous children’s TV series and has been on the forefront of TV production and interactive media for kids. From being selected as one of the first partners of Amazon Studios with the upcoming series Annedroids, to achieving Nick Jr.’s highest debut of all time with the action-packed Emmy-nominated series Dino Dan, Sinking Ship Entertainment brings dynamic content to audiences around the world with shows broadcast in more than 130 countries. Other series highlights include the award-winning This is Daniel Cook, This is Emily Yeung and Are We There Yet? : World Adventure. Find out more at www.sinkingship.ca.